There’s a new term making the self-care Twitter rounds: toxic positivity. It’s the idea that encouraging people to only be happy, positive, look on the bright side, etc. is more harmful than helpful. You’ve probably seen toxic positivity in action—it’s those Instagram posts that say “good vibes only” or “not here for bad feelings.” And while, for some people, those phrases might be the motivational kick they need, they fail to recognize that feeling our range of emotions—good and bad and meh—is actually the healthier route. Research shows that accepting, not rejecting, our negative emotions actually helps us better defuse them and leads to fewer negative emotions over time, leading to better overall psychological health. And a new study backs this up. The study, published in the journal Emotion, found that chasing happiness can cause us to obsess over any not-happy feelings, bringing us more unhappiness overall. Chasing happiness can cause us to obsess over any not-happy feelings, bringing us more unhappiness overall. Basically, the “all vibes welcome here” approach is the way to go—although that doesn’t make for the best Instagram quote. But just letting yourself feel is easier said than done. Here are 4 ways you can start to lean into emotional acceptance instead of emotional avoidance. The first step when you’re feeling a not-so-great emotion: Recognize how you’re feeling and how it’s tough. Accepting our feeling takes away its power. “Swimmers who are caught in an undertow and feel themselves being dragged out to sea often panic and begin to swim against the current with all their might. Often, they fatigue, cramp and drown. To survive, such a swimmer should do the opposite—let go. Let the current take him out to sea. Within a few hundred yards the current will weaken and the swimmer can swim around and back to shore. Even though Instagram might make it feel like everyone else is happy 24⁄7, it’s important to recognize that we all feel negative emotions—yes, even that person with 10K followers. Just recognizing that being unhappy is part of life can help us feel a little more in control. Just recognizing that being unhappy is part of life can help us feel a little more at peace. This is a moment of suffering. Suffering is part of life. May I be kind to myself in this moment. May I give myself the compassion I need. Our feelings don’t stop when we head to work—but there’s a way to stay true to your feelings while also feeling empowered through the work day. Deep acting is the alternative: “Instead of putting on a mask, you actually try to feel the emotion. That way, it comes out naturally,” Grant said. The trick is to identify what does feel authentic to you and communicate that in a way that supports your goals. Does that mean being salty to folks at work? Not necessarily. The trick is to identify what does feel authentic to you and communicate that in a way that supports your goals. So while you may be over your manager's micromanaging, maybe you get jazzed about the people you're helping in your day-to-day. Tap that feeling to start deep acting. One of the best tried-and-true methods of accepting our emotions: journaling. “Journals are like a checkpoint between your emotions and the world,” Beth Jacobs, Ph.D, writes in Writing for Emotional Balance: A Guided Journal to Help You Manage Overwhelming Emotions. 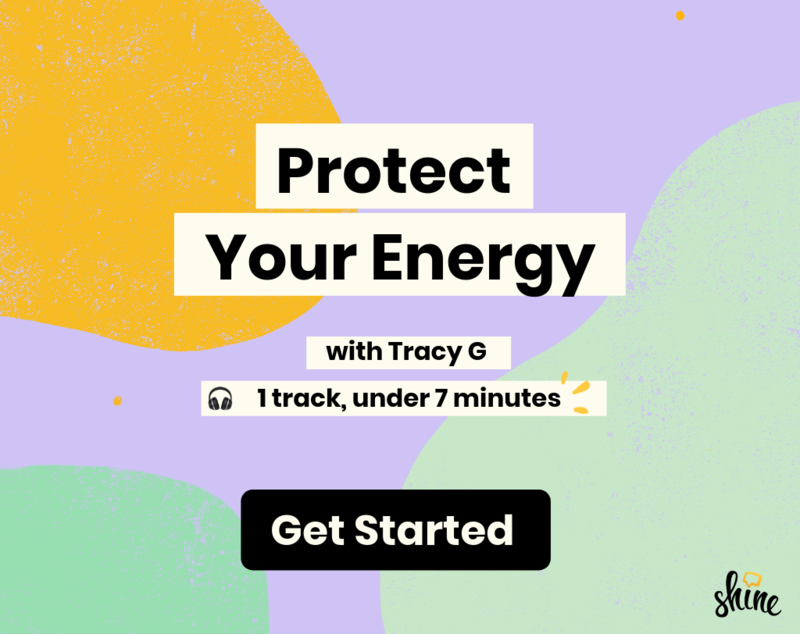 It’s a tactic that works for Mel Chanté, a New York-based poet, artist, curator of an incredibly inspiring Instagram, and the voice behind the Shine app’s new Exhale Anger meditation. The next time a strong emotion pops up, try putting pen to paper (or, fingers to smartphone) with an Expressive Writing exercise. Take a few minutes to just write about your feelings. One journaling framework the Greater Good Science Center recommends: try word association with your feeling. ●︎ What word or topic does it bring to mind? ●︎ What word or topic does that new one bring to mind? Keep associating new words with the feeling, and see if it starts to offer more clarity about what the feeling means to you. If things still don’t feel crystal clear? Know that’s OK—we can’t always make sense of our emotions. But what we can do is accept them and ride them out, knowing that they’re never permanent and a part of life. And if things still don’t feel crystal clear? Know that’s OK—we can’t always make sense of our emotions. And what does that look like when it comes to #motivation Instagram? Should we feel guilty for enjoying some of those “don’t worry, be happy” posts? No, but bringing emodiversity into motivation is important, yet somewhat uncharted territory—and we’re working hard to lead that conversation here at Shine.